Back of Beyond Baking: Time to say Goodbye! After two very happy years at the local village school, Master Vander-Cave is leaving to start high school. I was pleased that we moved him midway through his primary school career. He was settled in the town school he attended when we moved out to the back of beyond, so we agreed to keep him there for continuity and stability, even though it meant a 36 mile daily round trip! As the years passed Master Vander-Cave became unsettled in a difficult year group and his progress stagnated. Mr Vander-Cave and I were mindful of Master V-C's busy nature and desire to be outside and felt his talents may not lie in academia. Being told at parent teacher meetings that "Master Vander-Cave is just Master Vander-Cave" and "what can we do with him?" became a less than satisfactory response to our son's work and attitude. So we did what any sensible parent would do and decided to look at our other options. We found that our catchment school was one of the best schools in the county, with an outstanding ofsted and was one of the feeder schools for the high school we had already picked out for our boy. We could not believe our luck when we asked if there was a vacancy for our son and the response was "yes, we can take him." By the end of the first term we felt like we had made the right choice and our only regret was that we hadn't moved him sooner. Through this school our son's academic abilities have been encouraged and his learning supported. His non academic skills have been celebrated and nurtured and his school reports have changed dramatically. Suddenly he has gone from being a "silly boy, who needs to mind his own business" to a "really polite and friendly boy who brightens up the day for those around". His SATS results also bear witness to the change in him and he leaves primary school with age appropriate grades in all areas and an above average in his reading skills. Last night was the icing on the cake for us when at the school leavers celebration Master Vander-Cave was awarded the Phil Jones Cup for Sporting Endeavours. He was so pleased and Mr Vander-Cave and I were fit to burst with pride for our son. As leaving gifts for his teacher's I decided to do what I do best and bake cupcakes for them. I sourced some lovely pink spotty cupcake boxes from Morrisons and made half a dozen cupcakes for each teacher. 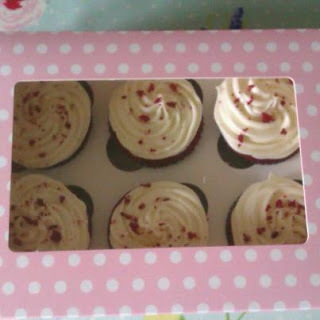 Red Velvet for Mrs P and Chocolate and Banana for Mrs H. I hope they both enjoy them. I cannot thank these teachers and all the staff at this school for their positivity, inclusive attitude, love and support that they give to all the pupils. These people really care about their pupils, it is not just a job to them and to see Mrs D (headteacher) welling up last night when she awarded the kindness award was extremely moving and sums up everything that is so good about the school. Below is the Red Velvet cupcake recipe. The chocolate and banana is already given on a previous post. 20ml red food colouring, I use a food colouring paste which needs about a tsp to provide the depth of colour needed. Preheat the oven to 170°C/325°F/gas mark 3. Line a cupcake tin with large cupcake cases. Turn the mixer down to slow speed and slowly pour in half the buttermilk. Beat until well mixed, then add half the flour, and beat until everything is well incorporated. Repeat this process until all the buttermilk and flour have been added. Scrape down the side of the bowl again. Turn the mixer up to high speed and beat until you have a smooth, even mixture. Spoon the mixture into the paper cases until two-thirds full and bake in the preheated oven for 20–25 mins, or until the sponge bounces back when touched. A skewer inserted in the centre should come out clean. Meanwhile for the cream cheese frosting: Beat the icing sugar and butter together in a freestanding electric mixer with a paddle attachment (or use a handheld electric whisk) on medium-slow speed until the mixture comes together and is well mixed. I like to pipe the frosting on top but you can just spoon the frosting over the cakes.